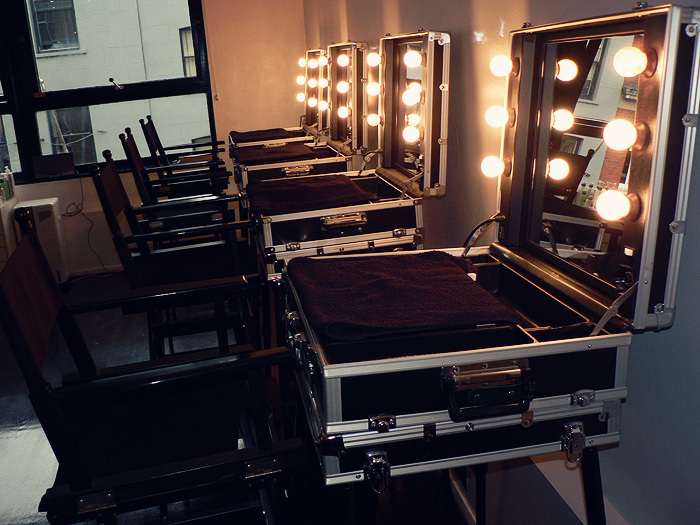 I was treated to a behind-the-scenes tour of acclaimed makeup school, The Academy of Freelance Makeup a couple of weeks ago so I headed into Soho, dodging thunderous downpours on the way. Highly aware of how completely rubbish my own makeup looked that day, I settled into my seat to listen to Jana Ririnui, the creator of AOFM Pro and Jason Mallett, the director of AOFM Pro explain more about the school. 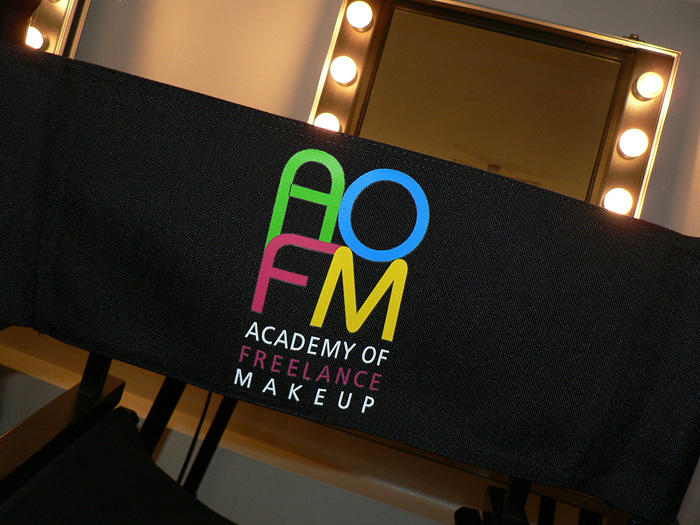 The core belief held by AOFM Pro is that their students will learn most efficiently from makeup artists currently operating in the freelance industry. Not only will students gather the techniques and theories from qualified tutors but also learn more about experiences that might befall them in the future when they join the ‘real world’ of a working makeup artist. Although the organised ‘curriculum’ is comprehensive, there’s also the opportunity for eager learners to gather knowledge through general class conversation with a working makeup artist… learning from anecdotes and tales of the fashion industry! The scope for picking up invaluable advice is only limited by the flow of natural conversation. In addition to this hands-on tutoring, students also benefit from the rotation of tutors, it’s the aim of the school to introduce their students to as many different working styles, techniques, creativity and products as possible. The final thing that I took away from my morning at AOFM Pro was the aftercare… the school offers free refresher sessions for past students and promise to always be on hand to offer professional advice long after you’ve walked out the door, makeup brushes in hand. 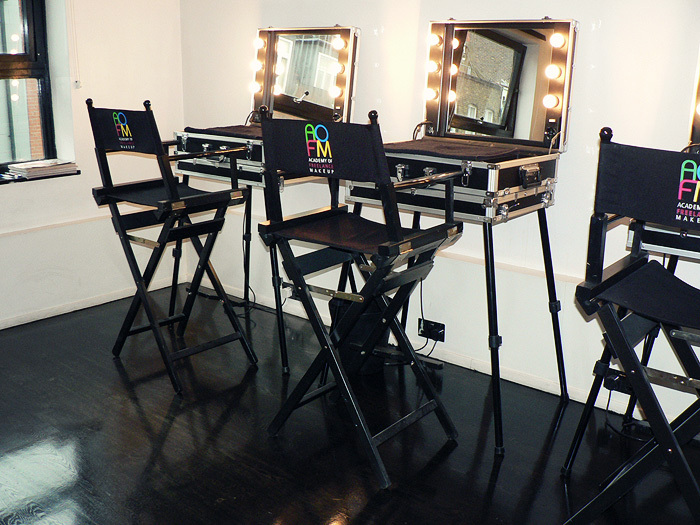 Thanks AOFM Pro for letting me have a nosey around your studios and in your beauty cupboards and a big thank you also to Jade, Assistant Head Of Education for a super hawt smokey eye to brighten up the rotten Summer downpours! How fun!! I wish I had the time to do this. I know! I had absolutely NO inclination to do any kind of makeup courses until I stepped out of AOFM. Luckily, the inclination has now passed again but it shows it’s lurking there! Ahhh have loads of fun Alice, when does your course start? Love to learn about how they train up people, and great pictures. 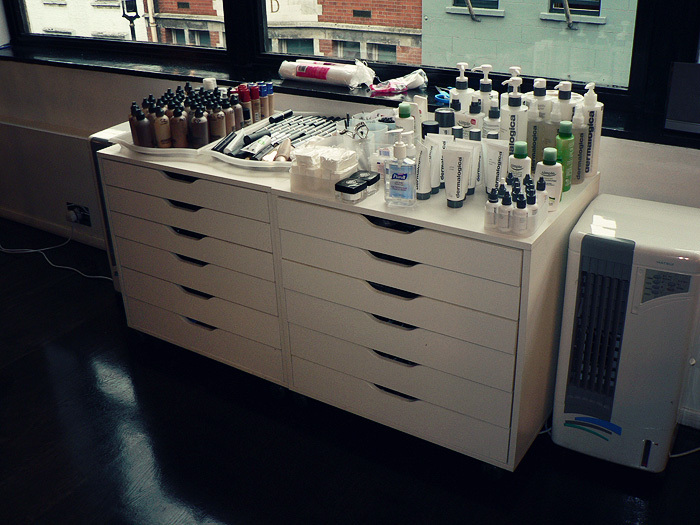 Do you know where they get the makeup desks? I wrote about these today, and can only source them from Asia! Sorry, I haven’t got a clue… you should drop them an email! Yeah, they made a point that it wasn’t all just high end stuff too because it’s useful for students to know how to work efficiently on a budget when they’re just starting out. It seemed really well considered. I remember going for an intro interview and for some reason it did convience me. I was constantly told “you will get a MAC pro card” and you can work at MAC for sure. As if that’s all I want to do after paying more than 1k for a course. They allowed me to go upstairs to one of the classes and it was quite interesting how their dinamic works. Also, I guess there was a bit of a catch because you can only get the aftercare thing when you do the advanced one only and you cannot go to the advanced if you don’t do the basic one. Or at least that’s what I was told…maybe a year ago. It can be different now. I also think (and it’s just me) that the course it’s about a week and even if you learn the very basics it’s all about practice practice practice and you will not get that there. The good thing is that it was hands on all the time. You read the notes (already printed for you) at home. I’m still in the search for a good make-up school for me. If you’ve been to one that you liked…let me know! That’s some really good, balanced feedback – thanks M! How fun! I’ve thought about pouring some spare cash into a class or two. Even though my blog is all about my awkward transition into makeup, I want to master it! Thanks for this and for all the pics! Just wanted to comment on your post. I read you were promised by our team you would get a job at MAC. This must be incorrect as AOFM would never promise such a thing. Although alot of our graduates have been offered Jobs at MAC all over the world Its up to our graduate to push them selves for employment not the school We can offer you the skills but you have to the ground work to get Jobs. Also you mentioned the 1K for one of our courses is very expensive. This is the most basic course we offer and many other schools offer much more costly courses. 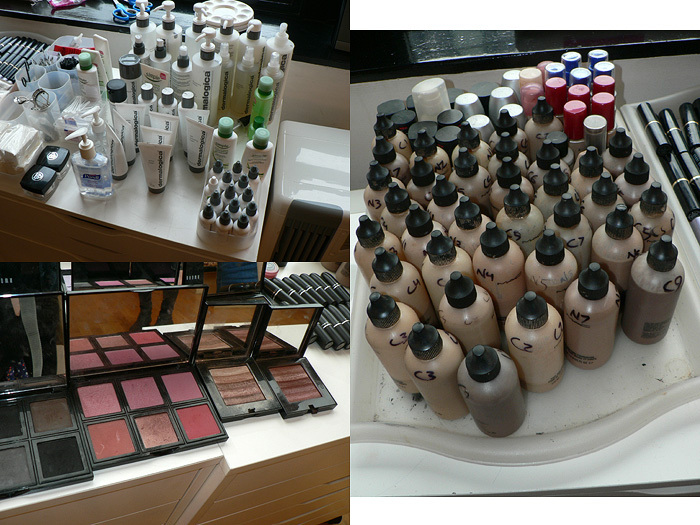 If you are serious about working as a professional makeup artist then you need to consider doing a longer course. There is no catch to our free 23 after care classes. Its only offered to graduates who are truly serious about there career and who are happy to put in the ground work to learn the skills. This is why we offer it to our 3 week and 4 week graduates. But we also offer aftercare to our Shorter course students also. We have a few Free master classes for as long as you like. With regards to after care and support. Please see our Facebook page were you will clearly see all the benefits our students get from studying with us. Such working backstage at Fashion Week in London Paris and NYC. Graduate Fashion week and many shoots with Top magazines. We pay For hotel and flights sending our graduates to work all over the world. Our after care is second to NONE and we always strive to give our students more and more work opportunities. Thanks for taking the time to respond and clarifying reader concerns Jana! I’m attending their classes on Monday, been quite nervous about it. Yet reading more into it, it’s a great opportunity I’m giving myself I believe. A chance to absorb and further my knowledge by professionals. Thanks for your posting this as it’s giving me a little bit more insight, think I managed to find the building on Google maps as it seems quite discreet lol. I searched and researched schools in my area for years before attending a makeup academy. After all my research i decided to go to one that cost $6000.usd which included my kit and photoshoot. There are schools now that you can find that are much less expensive or more, so looking into everything is very important and reading reviews. Im happy with my choice of school because with them too i can do refresh classes. If I lived in new york my school of choice would have been aofm, one day i hope to attend. I have heard great things about them and have both of their books that have tons of info. what makes them #1 to me is the fact that they stay active with their students which is their refresher course and projects/events. Their school is extremely reasonable i encourage people to learn more about them. I visited AOFM yesterday and I am considering doing a course with them. If you don’t mind, I was wondering if you could tell me about career opportunities you have had after completing this course. I desperately want to be a Makeup Artist and I am wondering what happens after the course is finished and I walk away with my qualification. I know AOFM offers graduates opportunities to work in Fashion Week, etc but have you had any other job opportunities? Do you know if they ask for a high school diploma? I’m sorry, I don’t know the ins and outs – perhaps send them an email? Hi! do you know if they accept foreign students?? Sorry, you’ll have to contact them directly for more information.